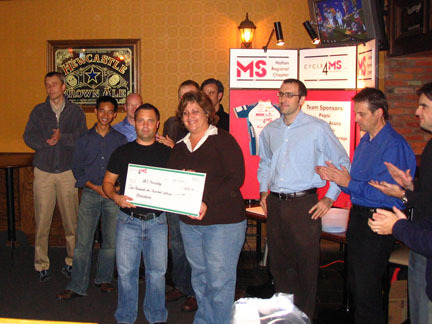 On Friday November 2nd, Cycle4MS hosted the 2nd Annual End Of Season Social. The idea of the night was to have fun and relax with fellow cyclists, family and friends and, at the same time, raise money for the MS Society Halton Chapter. Funds were raised through 50/50 draws, door prize ticket sales and silent auctions. At the end of the evening, the Cycle4MS team presented the Halton Chapter of the MS Society with a cheque for $1600. The End Of Season Social marked the end of the busy 2007 cycling season. However, Cycle4MS works to raise funds and awareness for the MS Society throughout the season. In the spring of '07, the team donated a GOGO scooter to the MS Society and during the summer we sponsored $1000 for the Halton Chapter's annual golf tournament. None of this would be possible without the support of our team sponsors.